The Cayman Islands currently has architectural firms with qualified interior architects and designers specializing in corporate interiors, many with extensive international experience. In the progressive climate of today’s global business world, creating a successful and enduring corporate workplace goes well beyond merely designing beautiful spaces. It is important to start the design on a comprehensive brief defining functional and aesthetic requirements which can include setting goals for the promotion of your team’s wellbeing, accounting for technological advancements in your industry or articulating your company’s core values as they may apply to a physical space. Involving your designer prior to selecting a new office space can be very beneficial as they may assist in evaluating available spaces for your company’s needs prior to agreement to lease or purchase. This analysis may involve a ‘test fit’ of the space to ensure it will meet either short and/or long term requirements, check lease area measurements and evaluate base building mechanical, electrical and communications infrastructure. With a current trend towards ‘open plan’ offices requiring less space per employee, creating a successful ‘open’ plan requires skillful space planning. Providing areas of acoustic and visual isolation responsive to your unique organizational needs will help to limit unwanted disruptions and loss of focus whilst still maintaining the goal of an open office environment of shared natural light, flexibility and connectivity of your employees. 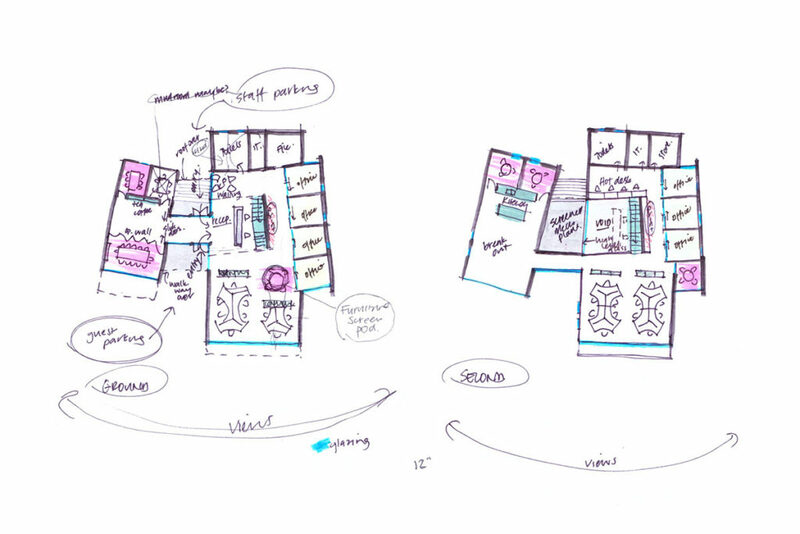 Many people have a great deal of difficulty in visualizing a spatial layout from two dimensional plan drawings. When looking at proposed designs with your design team, 3D representations can be a great help in visualising your new workplace in the early phases of the design process. These visual aids can be valuable in clarifying the design intent before progressing with detailed documents that are required for construction and obtaining required statutory approvals. All fitout works in Cayman are required to meet our local building code requirements, plans and specifications must be submitted to the Central Planning Authority to obtain a building permit prior to construction. Many architectural firms also have experience in working with international rating authorities such as LEED, Green Star, BREEAM, WELL Building Standard and other globally recognized rating systems that promote more sustainable, energy-efficient and healthy fit-outs. These standards can benchmark your organisation’s commitment to creating a better workplace against internationally recognized industry standards.